The Ankh-Morpork Times -> Christmas arrived early this year! The best presents are the one you make to yourself ;). 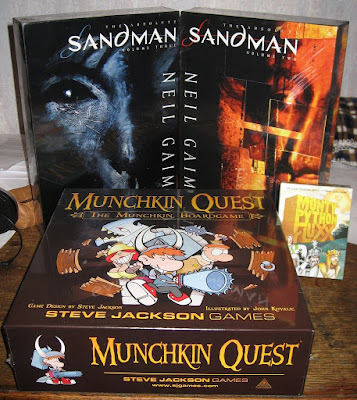 So when I walked into Phantom of the Attics Games, my favorite Game Store in Pittsburgh, I didn't hesitate to buy the long-awaited Munchkin Quest. At the cash register, I then noticed Monthy Python Fluxx, which I bought after studying two of the cards ;). When I got home there were more surprises, the first package from Amazon.com with Absolute Sandman Vol. 2 and Vol. 3 was waiting for me! After a Toast Hawaii dinner at Guido's place we got a chance to play Monthy Python Fluxx and it is as silly as it promised to be :).